To some listeners, "experimental music" is a scary term. The stigma attached to so-called "other music" is that it's the province of pretentious, overintellectualizing artists and is nefariously designed to confound audiences rather than entertain them. There might be a sliver of truth to that notion. By its very nature, experimental music is provocative and intentionally resides beyond the bounds of conventional musical expression. As such, it attracts a niche audience. However, general listeners can find palatable access points within the experimental spectrum. Boogoloo for Improvisors by the le duo is one such point for local audiences looking to expand their sonic horizons — and maybe their headspace. Led by drummer JB Ledoux, the le duo describe themselves as "a creative outlet for iNprov," or "inclusive improvisation." Though the five-track suite certainly exists on the outer fringes of local music, Boogaloo is an inviting record that might help demystify and destigmatize experimental music in Burlington. The record opens on "2:04 am," a solo percussion piece that plays like the disquieted mind of an insomniac struggling for sleep in the wee hours. It's jarring and disjointed but strangely compelling. It's also kind of a red herring, given the guitar-centric funk and soul-inspired compositions that follow. "Squish's Boogie" is next and sounds something like Parliament on an acid trip. Adrian Benoit's guitar shimmies and shakes with an exquisitely clean tone, in sharp contrast to Adam Ploof's scuzzy Rhodes licks. Ledoux and bassist Gahlord Dewald forge a firm rhythmic bond, laying the foundation for the seven-plus-minute space jam. "Elmer's Van" takes a darker turn. It's woozy and mysterious, with Ploof's Rhodes harking to late-'60s psychedelic rock. Ledoux's skittering beat propels and anchors the piece but allows for high-flying histrionics. "The Lilac Crest" offers a moment of serene respite. Synth tones bloom and dissipate around gently meandering guitar and cascading cymbal rolls. Then Dewald's bass slithers in, seeking out Ledoux's laid-back beat, and the song coalesces. If the preceding cuts were the druggy freakout, this one is the comedown, the moment of exhausted clarity. Yet you know the strung-out shakes are coming. And come they do, as the record closes on the funkadelic abstractions of "He Who Brings Pain." Ledoux's insistent beat hammers dully, like a migraine. Over this, Ploof and Benoit trade shooting riffs with little regard for meter. Of the five cuts, this one is the farthest out. But it's also a pitch-perfect ending to an album that provides a solid fix for experimental music fans and may serve as a gateway for new listeners. 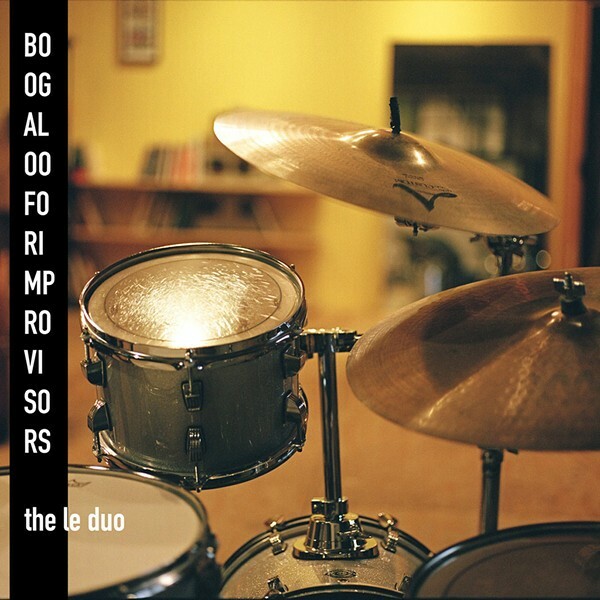 Boogaloo for Improvisors by the le duo is available at theleduovt.bandcamp.com.